The fallen heroes of the Space Shuttle Columbia have taken their place at the hallowed ground of Arlington National Cemetery. NASA Administrator Sean O'Keefe presided at the dedication ceremony today -- one year and one day after the tragedy which claimed the lives of the seven STS-107 crew members. Administrator O'Keefe called the Columbia crew "heroes for our time and for all times," adding that they were all "motivated by a fire within -- a passionate eternal flame in each of their souls." O'Keefe also repeated President Bush's call to create a "living memorial" to the crew, by giving NASA a "new focus and vision to take humans back to the moon and beyond." The ceremony closed with stirring musical performances from the U.S. Navy Band, the U.S. Air Force Singing Sergeants and singer Patti LaBelle, who sang her Grammy-nominated song, "Way Up There." LaBelle originally performed the song at the Columbia memorial at the National Cathedral in Washington last year. The new memorial is just a few feet away from another one honoring the crew of the Space Shuttle Challenger, lost on January 28, 1986. Administrator O'Keefe laid a wreath at that site on the 18th anniversary of the accident. It's a solemn, reflective time of year for NASA, with the anniversaries of the Columbia, Challenger and Apollo 1 accidents all falling within a week. Administrator O'Keefe announced last week that the agency will observe a Day of Remembrance each year on the last Thursday in January, honoring those three crews and all who have given their lives in the cause of exploration and discovery. Administrator O'Keefe told NASA employees that the agency must learn from its tragedies "as profoundly as we do from our triumphs." He also urged employees to reflect "every single day" on the fact that "the consequences of us not getting it right are catastrophic." 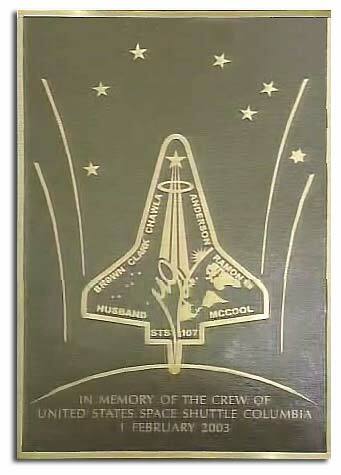 Image right: NASA Administrator Sean O'Keefe praised the STS-107 crew as "heroes for our time and for all time." All three crews have also been honored on Mars: The Spirit rover's landing site has been named Columbia Memorial Station, Opportunity's landing site has been named Challenger Memorial Station, and three hills visibile from Spirit's site have been named for the Apollo 1 crew. The Columbia crew was also honored in a pre-game ceremony at Super Bowl XXXVIII on Sunday -- the one year anniversary of the accident. This year's game was in Houston, home to NASA's astronaut corps and the Johnson Space Center. For the NASA family, the Columbia crew and the other fallen astronauts remain an inspiriation, pushing the agency to continue to explore. "Every day when I drive to work I see reminders of the Columbia crew," says Commander Eileen Collins, who will lead the STS-114 crew, set to return shuttles to safe flight. "I have reminders at home, I have reminders in my office, and I want those reminders because while initially they were sad, they're not as sad anymore; I'd say they're more strengthening; they're making me want to make more of a commitment to the program and to continue their legacy and to continue their mission."